It was their first official public engagement together as a royal couple. 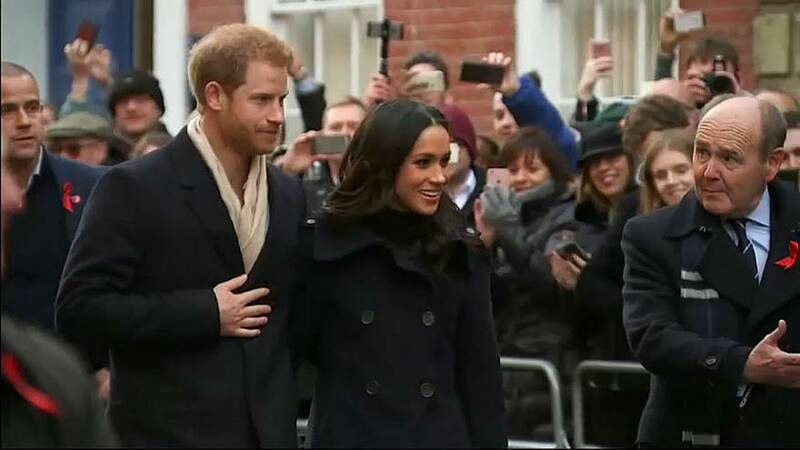 Hundreds of people braved cold weather to get a glimpse of Prince Harry and US actress Meghan Markle as they attended a charity event in Nottingham. The couple's engagement was announced earlier this week and a wedding is planned for the Spring. One man in the crowd said: "There's certainly a feel-good factor and with Meghan on the scene even more so. I think everyone's taken her to their hearts!" A young woman said she was there to see Meghan. "I love 'Suits' (a TV series that Markle is in). So I thought I'd try to catch a glimpse. And the atmosphere's really nice." NBC News Corresponent Kelly Cobiella, reporting for Euronews, said: "The couple are here to mark World AIDS day and also to visit a youth programme that Harry started here a few years back. "Not a single sign of nerves from Meghan and the crowd loved her."